The findings are important for understanding the body’s immune defense system, searching for compounds to turn the immune system on or off, and they may help combat autoimmune diseases, in which overactive immune cells attack healthy tissues. 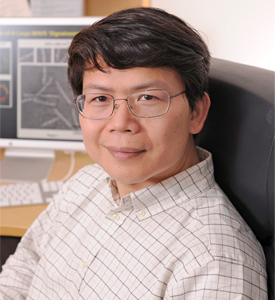 Dr. Chen and his team studied a protein called MAVS, which they discovered in 2005 and showed that it is an adaptor protein essential for interferon induction by RNA viruses such as influenza virus. In the new study, they found that MAVS is modified by the addition of a phosphate group (phosphorylated) by an enzyme called TBK1 when cells are infected by a virus and that this modification is important for IRF3 activation.